Um, wireframe plx before anyone considers dedicating themselves to getting that ingame. You mean like this, Inyri? Yes, like that; thanks. I would recommend working on it a little more, since you look like you've got EaW quality work there instead of Jedi Academy work. Feet don't need to be rectangles. Your model is also not set up for deformation at all. 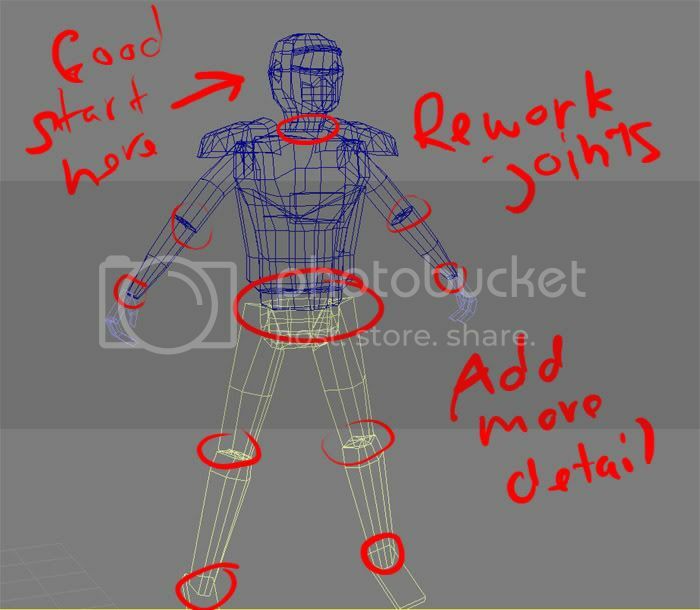 There should be some links in the master sticky to sites with good general modeling tutorials that'll tell you how to better set up your model to animate well in-game. Joan of Arc is a little too intense, even for JK3. Besides, if he makes a model that comes even close to the tutorial's (and I don't mean the actual model itself), he's more than ready for JA.